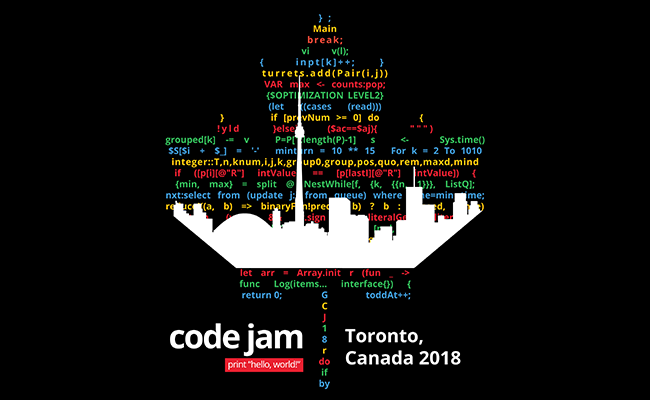 Google’s longest-running programming competition, Code Jam, is bringing their World Finals to Google Toronto for the first time ever in August. Toronto will host 39 of the savviest programmers representing 15 different countries who’ve made it through four rounds of intense, algorithmic challenges to beat out over 60,000 registrants. Toronto, and the wider Toronto-Waterloo corridor is a hub for technology and innovation, and we are so excited to be able to share this culture with some of the best programmers from around the world. The finalists joining us next week have dedicated countless hours of hard work and determination in the online rounds to get to this very moment, and will come together in one room to compete for the championship title and grand prize of up to $15,000. Leading up to the finals, we spoke with Samuel Huang, a software engineer at Google Canada's engineering headquarters in Waterloo, a former Code Jam participant, and a volunteer for this year’s competition about his Code Jam experience. What was your favourite part about participating in Code Jam? Samuel Huang: Day-to-day programming work is like writing books, and solving contest problems is like writing poems. These require related but slightly different skill sets. It's educational and refreshing to solve Code Jam problems. I'm consistently amazed by the creativity of problem writers. Solving a challenging problem is rewarding, and anything I couldn’t solve pointed to a gap in my knowledge that I can improve on. Most of all - I enjoyed the camaraderie. It was nice to meet so many people with similar interests as me. Since you’re volunteering at this year’s finals, what are you looking forward to the most? SH: I’m very excited to meet this year’s contestants and hear the perspectives of a new generation of coders. I can’t wait to be amazed by their skills, and learn from them as well. What are your words of advice for this year’s finalists? SH: Be flexible and adapt to the occasion, be it contests, or interviews, or hackathons, or production work. Software engineering is about managing complexity and making trade-offs -- so in addition to doing what you do best, it would be valuable to know to switch gears for different situations, and don't be afraid to ask questions whenever you're unsure. To follow along, tune into the Code Jam World Finals livestream on August 10th at 12:30 PM EST. Can’t wait another week? Submit your questions to be featured on the livestream by tagging your social media posts with #TalkToCodeJam and participating in the #CodeJamFinals conversations on Twitter, Facebook and G+.